Our sausage, bacon and scrapple products are made with only the finest quality ingredients. That’s why Ed Hipp Foods, Inc. has grown to be the #1 beef and turkey product company in the Delaware Valley. We currently serve Southeastern Pennsylvania, New Jersey, and Delaware. Our products are sold in major supermarkets, including Acme, Shop Rite, Fresh Grocer, Giant, Redner’s, Shop ‘N Bag, Save A Lot, Thriftway and Great Value, as well as many neighborhood stores. Our bacon products are either all-beef or all-turkey. Each one has a distinctive flavor that comes from the natural ingredients and our exclusive blend of spices. All of our beef products are made of 100% beef cattle raised in America — no filler — and our exclusive combination of spices ensures they are 100% delicious. We use only 100% beef or turkey in our sausage products. Our exclusive blend of spices ensures each product has a distinctly delicious taste. All of our turkey products are made from 100% turkey raised in Pennsylvania and our exclusive combination of spices ensures they are delicious. Ed Hipp’s beef and turkey products can be purchased in most major supermarkets as well as neighborhood stores across the Delaware Valley. The address of each location is on the Where to Buy page. 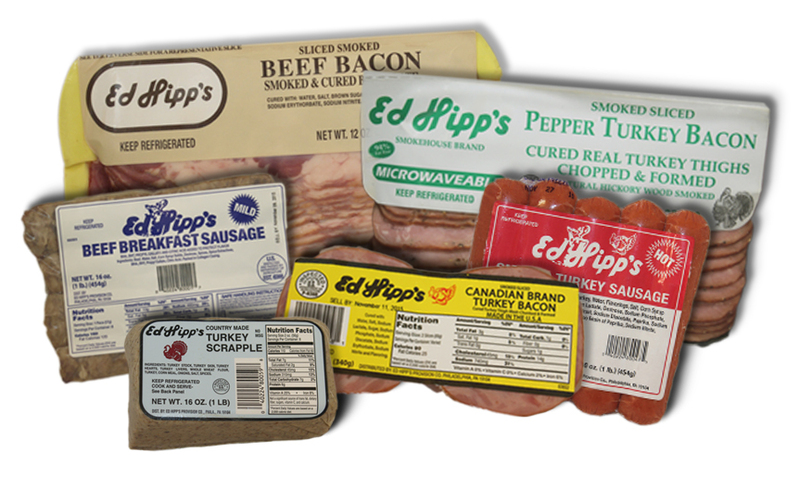 Representatives of supermarkets, neighborhood stores and restaurants may inquire about carrying Ed Hipp’s sausage, bacon and scrapple products using the contact form on this website.